HIFF and Guild Hall are pleased to announce an exciting new series of screenings, titled NOW SHOWING, that will bring notable films currently in theaters to East Hampton. On select Saturday nights, the series, curated by HIFF, will feature acclaimed first-run art house, independent, and world cinema in Guild Hall’s John Drew Theater. 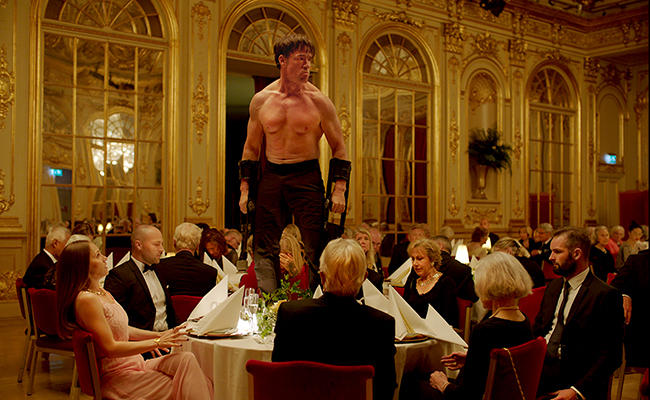 On Saturday, December 23, the series features the 2017 Cannes Palme d’Or winner, THE SQUARE, from director Ruben Östlund, about a Stockholm museum curator preparing for a new exhibition while experiencing a crisis of conscience. Shown at sold-out screenings during HIFF 2017, the film stars Claes Bang, Elisabeth Moss, Dominic West, and Terry Notary. Nominated for a Golden Globe® for Best Foreign Language Film! A precisely observed, thoroughly modern comedy of manners, Ruben Östlund’s Palme d’Or–winner revolves around Christian (Claes Bang), a well-heeled contemporary art curator at a Stockholm museum. While preparing his new exhibit—a four-by-four-meter zone designated as a “sanctuary of trust and caring”—Christian falls prey to a pickpocketing scam, which triggers an overzealous response, and then a crisis of conscience. Featuring several instant-classic scenes and a vivid supporting cast (Elisabeth Moss, Dominic West, and noted motion-capture actor Terry Notary), THE SQUARE is the most ambitious film yet by one of contemporary cinema’s most incisive social satirists and the rare movie to offer as many laughs as ideas. Tickets are $15 for general admission and $12 for HIFF and Guild Hall members. HIFF members: purchase tickets online from Guild Hall and select ‘member price’ to receive your discount (your name will be checked against our member roster). Enjoy!